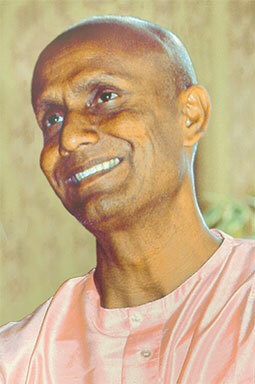 Spiritual teacher and peace advocate Sri Chinmoy (1931-2007) was also a prolific writer, poet, artist and a great sportsman. In his youth he had a lot of success in the Sri Aurobindo Ashram in Pondicherry and later in the West he ran marathons, ultra distances, did biking and many other sports. Watch him practise the javelin on a meadow behind his tennis court in Jamaica, Queens. NY. We are celebrating Sri Chinmoy’s 87th birthday with a meditation video from August 1991, 27 years ago. In the background you hear disciples singing Bengali songs by Sri Chinmoy. End of July there was a special open-air concert held in the river bed near the waterfall of Gibswil, Switzerland (about 1 hour drive from Zurich). It was organized by Anete from Zurich and performers were Alap & Lukas (flutes and drums) and Anete’s music group “Heart-Garden Birds”. In the background you could hear the waterfall which mingled nicely with the musicians. Alap & Lukas improvised on their instruments and the girls’ music group performed melodies of Sri Chinmoy. Kedar was filming the event.